If you've been diagnosed with gum disease, there are a variety of treatment options depending on the complexity of your situation and the severity of the problem. We always start with the most conservative and least invasive options, including non-surgical therapies and deep cleanings. In more advanced cases, additional surgical treatment may be necessary. The first line of defense against the spread of gum disease is a unique type of cleaning called “scaling and root planing.” In this procedure, an ultrasonic cleaning device is used to remove plaque and tartar from your teeth where regular cleaning devices can't reach: under the gum line on the tooth and the root. The goal is to leave a healthy, clean tooth and root surface that makes it easier for the gum tissue to reattach to the tooth. If gum disease treatment is initiated before it becomes severe, scaling and root planing may be the only treatment you need. However, as with any dental procedure, your home care is essential to maintaining a healthy mouth and ensuring that our treatments are successful. In order to maintain a healthy mouth and resist future occurrences of gum disease, you must brush and floss daily, eat a healthy diet, avoid tobacco use, and have regular dental checkups. During pocket reduction procedures (also known as “gum surgery”), we fold back the gum tissue and remove the bacteria hiding underneath, as well as the hardened plaque and tartar that have collected. We re-shape the tissues around the teeth and stitch the healthy tissue back into place. Now that the tooth and root are free of bacteria, plaque, and tartar, and the pockets have been reduced, the gums can reattach to the teeth. When the bone and tissue supporting the teeth has been lost due to severe gum disease, we can restore these areas with a regeneration procedure. 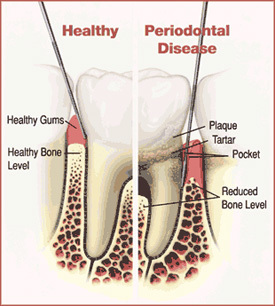 During this process, we begin by folding back the gum tissue and removing the bacteria, plaque, and tartar. Then, depending on the extent of tissues destruction, we may perform a bone graft to stimulate new bone growth in conjunction with tissue growth factors to repair the areas that have been destroyed by the disease. For additional information on periodontal and implant treatments, please check the services page or call our office at 503-222-9961.